Explore the full line of penetrants, lubricants, rust inhibitors and other specialty, highly-concentrated formulas for the automotive, industrial, marine and hardware industries. The #1-selling penetrant since 1957, PB B'laster quickly busts loose rusted or frozen parts caused by rust and corrosion. It also contains a non-evaporating lubricant that saves time and equipment and protects against further rust and corrosion. B'laster Multi-Purpose Lubricant is a high-performance formula designed to lubricate moving parts in and around the house such as window tracks, hinges, chains, glides and gears. Formulated with Teflon™ Fluoropolymer to help reduce friction and wear, enhance performance and protect surfaces. It outperforms leading competitors, and prevents rust and further corrosion on car parts, fishing reels and tackle, all tools, firearms, sports equipment, marine applications and more. B'laster White Lithium Grease is low-odor, clean, white grease that lubricates by creating a protective barrier. It protects against moisture and oxidation and is safe for a wide range of applications. It provides low-friction lubrication and heavy-duty protection. B'laster Garage Door Lubricant is a silicone-based lubricant that leaves a tack-free film that won't accumulate dust and dirt. Formulated with Teflon™ Fluoropolymer to help reduce friction and wear. In some instances, its extreme pressure agents make it a suitable replacement for grease. It effectively helps stop squeaks associated with garage doors and mechanisms. B'laster Dry Lube is formulated with Teflon™ Fluoropolymer, which helps reduce friction and wear, protect surfaces and enhance performance. Use it on locks and catches, hinges, cables, window and door tracks, rope and conveyor belts. It provides superior lubrication and is safe for use on most plastics. B'laster Citrus Based Degreaser removes tar, grease, oil, resin and adhesive from virtually any surface. As one of B'laster's most versatile products, Citrus Based Degreaser has countless applications. It is fast acting, easy to use by spraying on and wiping off and rinses clean with water. B'laster Chain and Cable Lubricant is a long-lasting formula designed specifically for use on any light-duty chain or wire cable applications. Formulated with Teflon™ Fluoropolymer to help reduce friction and wear. It prevents further rust and corrosion and sheds contaminants like mud, grass and water. It will keep equipment at peak performance by running better for longer. B'laster Small Engine Tune-Up is formulated to assist in the preventative maintenance of all two and four-cycle combustion engines. It dissipates moisture and inhibits rust and frees rings and valves, restoring compression, power and vacuum. B'laster Corrosion Stop protects metal surfaces by leaving a protective film. It penetrates and resists water, displaces moisture and prevents further corrosion. B'laster Graphite Dry Lubricant reduces wear to extend equipment life. It creates a quick drying film that provides long-lasting lubrication. It's recommended as a general maintenance lubricant on gaskets, transfer belts and conveyor belts. Also for use for high temperature, low load, locks, rollers, wheels, gears, chains and hoists. B'laster Air Tool Conditioner thoroughly cleans internal pneumatic tool parts, restoring them to peak performance and prolonging tool life. It breaks loose deposits that create friction and impede smooth operation. It also provides long-lasting lubrication and protects tools from freeze up. B'laster Air Tool Lubricant lubricates and protects internal tool parts. It ensures maximum tool performance, prevents unnecessary maintenance and also protects tool parts from high speeds and shock loads. B'laster Fuel Injector Cleaner restores lost power and improves performance and mileage. It will clean and condition fuel injectors, fuel pumps and fuel systems. Feed ports and tips are left cleaned, lubricated, balanced and clog-free. Fuel Injector Cleaner removes harmful carbon and varnish deposits from upper cylinders, manifolds, exhausts and converters. 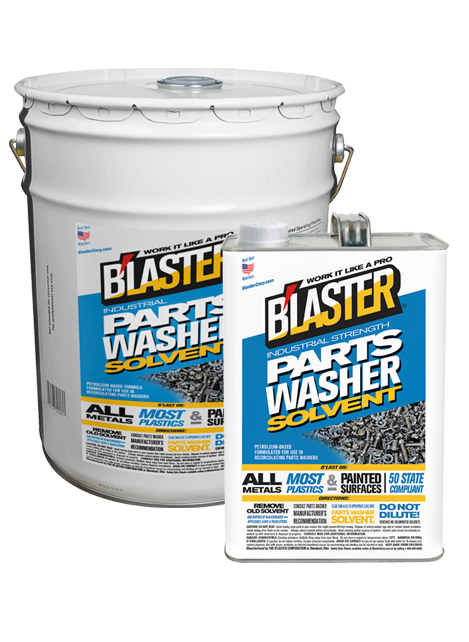 B'laster Parts Washer Solvent has been developed to outperform the usual mineral spirit based solvents most often found in re-circulating parts washers. It safely and quickly removes oil, grease and grime from metals, most plastics and painted surfaces. It leaves no residue making it perfect for parts that will be painted.